Protecting your people - Avoiding chemical injuries occurring to your staff and visitors is always a top priority for any business that may have harmful chemicals on site. The consequences of a chemical injury can be serious, and can include burns, eye injuries and respiratory problems. Displaying a Chemical Sign is an effective method of warning everyone on your work premises of the dangers present. By using an easy to understand warning sign you allow people to protect themselves appropriately and also help to ensure you meet current safety legislation. Make it clear - It’s important to be able to relay safety messages in a clear and concise manner. By ensuring areas of potential risk have the signage featuring unmistakable warnings you can help to ensure the welfare of your employees and visitors. 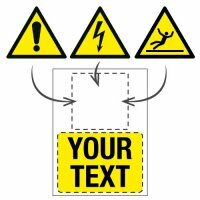 Our range of Chemical Signs includes the easily recognisable hazard triangle containing different images within depending on the nature of the hazard. The image inside the triangle can simply feature the standard black X symbol; an instantly recognisable sign of potential harm. Choosing the right symbol - Alternative images, such as those found on our ‘Warning Corrosive’ Signs, ‘Dangerous Chemicals’ Signs and ‘Danger Acid’ Signs can provide more specific information on the hazard involved. More information, including the name of the chemical, is featured on some chemical signs in clear bold text. Other signs, such as our ‘Caution Chemical Store Guidance Safety’ Signs provide guidance on the meaning of GHS symbols to help ensure that everyone understands the potential risks while in the hazardous area. Taking responsibility - As an employer, you have a legal duty to take steps to protect your workers from chemical injuries by taking measures such as using Chemical Signs. The regulations surrounding health and safety can appear hard to negotiate and leave many companies unsure if their measures are sufficient. 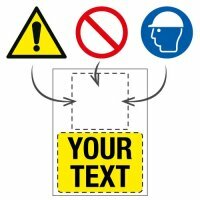 Seton is one of the UK’s leading suppliers of workplace safety signs and equipment. We make sure that all of our products comply with the EU and UK health and safety rules, giving you the peace of mind of knowing that you are doing everything that you can to prevent an accident. Chemical Signs can be an effective addition to your overall chemical management strategy and will help to prevent accidents. We have a range of Chemical Handling and Storage Equipment to enable your chemicals to be securely stored or moved around the premises. We also have a range of Personal Protective Equipment to protect employees who work with the chemicals. While all of this will greatly reduce the likelihood of accidents, spills can still occur. Make sure that you can deal with them quickly and efficiently by keeping COSHH and Spill Control Kits always ready. Ultimate flexibility - To make our Chemical Signs as versatile as possible, they are available in a range of different materials. We have signs that are suitable for both indoor and outdoor use, as well as photoluminescent (glow in the dark) options ideal for areas of dim lighting, or to continue to provide a warning in the event of a power failure. We also have a wide range of Sign Fixings available allowing you to position your signs wherever and however you require. For example, our self-adhesive vinyl signs are particularly ideal to fit to the curved sides of chemical cylinders. With so many different chemicals and related hazards present in chemical industries, you may require a Chemical Sign that is not included in our current range. If so, please contact us. With our custom sign service, we can create a chemical sign to fit with both your requirements and health and safety standards.